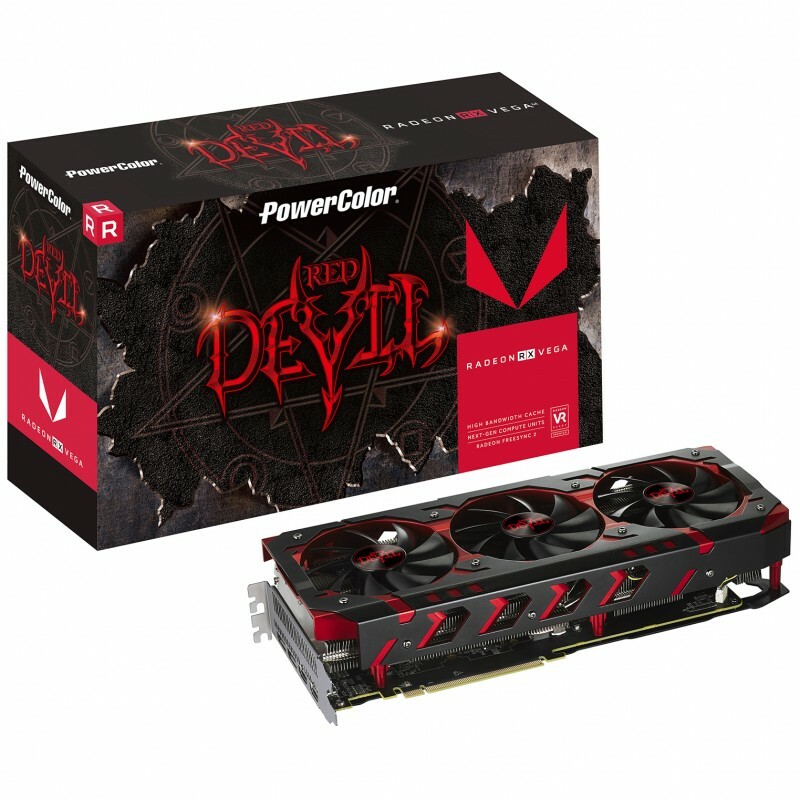 Spotted just a few days back, the specifications of PowerColor’s Radeon RX Vega 64 Red Devil have been revealed. Being one of the few Radeon RX Vega graphics card that uses a custom design, the graphics card will be featuring a massive cooling solution and faster clock speeds to deliver better performance to red team users. The specifications were listed by Overclockers.co.uk (Via Videocardz) and reveal almost everything we need to know about the card. Coming in only RX Vega 64 flavors, the Red Devil features a total of 4096 stream processors which are clocked at 1417 MHz base and 1607 MHz boost. The speeds are definitely faster than the reference air cooled models but slightly below the liquid edition that can boost up to 1677 MHz. Aside from clocks, we are looking at 8 GB of HBM2 memory clocking in at 1.9 Gbps along a 2048-bit bus interface while power is being supplied through dual 8 pin power connectors leading to a 295W TDP. 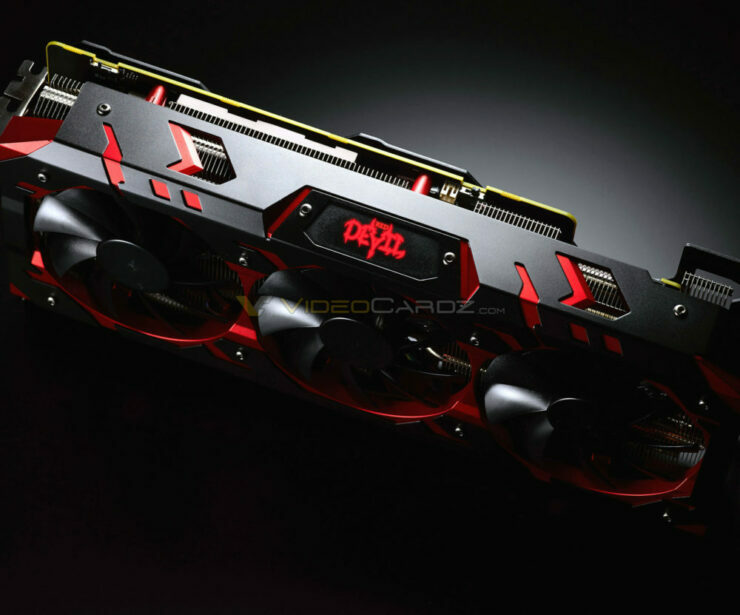 In terms of design, the card boasts a massive triple slot shroud that features a red and black color scheme. The card additionally features a triple fan cooling design and a triple-BIOS solution which should provide some good cooling and overclocking support to the users. The card also has a Devil logo on the side of the shroud which I believe should illuminate with LED lighting. The whole cooler assembly is pretty huge as it features a large aluminum fin array and a number of heatpipes for a better heat dissipation system. Lastly, we have the PCB which sticks to the reference design but only wider to accommodate the large cooling system. The card features 12+1 phase PCB design and the Vega 64 GPU sits right in the middle of the card. For display, the card will get you two HDMI and two DisplayPort connectors. Pricing for pre-order is mentioned at £589.99 while word is that the card will be available in market during next month.